Yet when asked about specific policies to address the energy supply, a majority of Americans continue to support allowing more offshore oil and gas drilling in U.S. waters (56%) and more mining and drilling on federally-owned land (58%). These opinions are largely unchanged from recent years. At the same time, 81% favor requiring better fuel efficiency for cars, trucks and SUVs. The share supporting improved fuel efficiency has risen eight points since September 2013. In November, the Pew Research Center found that the public continues to favor construction of the Keystone XL pipeline, though by a smaller margin than a year earlier. About six-in-ten (59%) favor building the pipeline while 31% are opposed. The same survey found that more Americans oppose (47%) than favor (41%) the increased use of fracking to extract oil and natural gas from underground rock formations. The balance of opinion on fracking has tilted more negative; in March 2013, more favored (48%) than opposed (38%) the increased use of fracking. Overall, 54% say that from what they’ve read and heard, the amount of energy produced in the U.S. has been increasing in recent years; just 10% say it has been decreasing, while 27% say it’s been staying about the same. 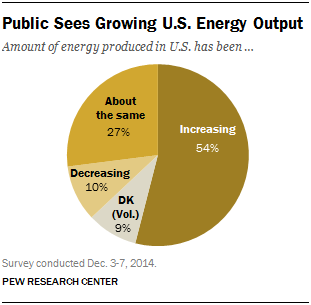 Last fall, somewhat fewer (48%) said they thought energy production in the U.S. was up. College graduates are among the most likely to say the amount of energy produced in the U.S. has been increasing (67%); those with no college experience are less likely to hold this view (44%). While the public prioritizes developing alternative sources of energy over expanding production of fossil fuels by a 60%-30% margin, attitudes on this question vary widely across demographic groups. Adults under 30 express broad support for prioritizing alternative energy development over expanding traditional sources (74%-20%). By contrast, those 65 and older are roughly divided over whether developing sources such as wind, solar and hydrogen is the more important priority (48%) or whether expanding production of oil, coal and natural gas should be given more priority (41%). By a 53%-36% margin, more Republicans prioritize the production of oil, coal and natural gas over the development of alternative sources of energy. By contrast, 72% of Democrats and 66% of independents say developing alternative energy sources should be the country’s more important priority. 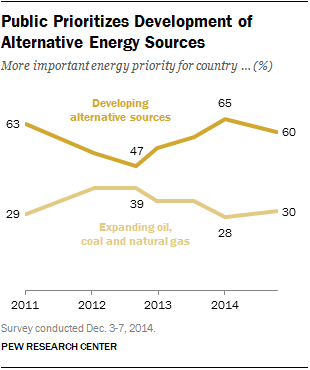 Across regions, support for prioritizing alternative energy development is lowest in the South (52%). At least six-in-ten in the Midwest (62%), Northeast (66%) and West (67%) say it’s more important to develop alternative sources such as wind, solar and hydrogen technology than to expand the exploration and production of oil, coal and natural gas. 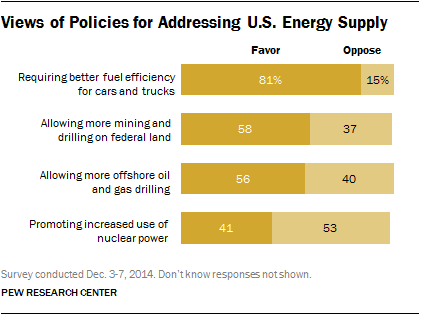 There also are wide differences between Republicans and Democrats in their support for specific U.S. energy policies. 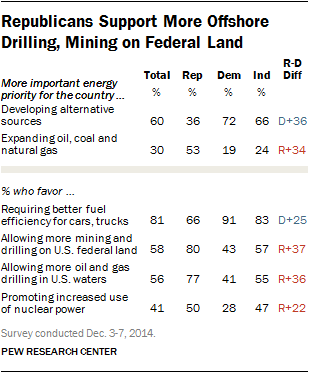 About eight-in-ten Republicans say they are in favor of allowing more mining and drilling on federally owned land (80%) and allowing more offshore oil and gas drilling in U.S. waters (77%). By contrast, support is far lower among Democrats: just 43% back more mining and drilling on federal lands, while 41% support expanding offshore drilling. The increased use of nuclear power is not especially popular with either party, though significantly more Republicans (50%) than Democrats (28%) back this policy. One area of general agreement is on better fuel efficiency standards for cars, trucks and SUVs. Fully 91% of Democrats support this policy; Republicans are 25 points less likely to back stricter fuel efficiency standards, but a 66% majority join Democrats in saying they favor this policy. Consistent with the high priority younger adults place on developing alternative sources of energy, they are less supportive of expanded mining and drilling in the U.S. than are older Americans. When it comes to allowing more mining and drilling on federally-owned land, those ages 50-64 and 65 or older back this policy by about two-to-one (66%-30% and 62%-30%, respectively). Younger adults are more divided. Among those 18-29, 52% favor this policy, while 45% are opposed; the balance of opinion is similar among those ages 30-49 (52% favor, 41% oppose). More than six-in-ten of those ages 50-64 (66%) and 65 or older (62%) favor more offshore oil and gas drilling in U.S. waters. By contrast, support falls to 54% among those ages 30-49 and drops to 42% among those ages 18-29. Age divides are less prominent when it comes to fuel efficiency standards for cars and trucks, and promoting the increased use of nuclear power. Broad majorities of all age groups support requiring better fuel efficiency for cars, trucks and SUVs. On nuclear power, fewer than half across all age groups say they favor promoting its increased use in the U.S.